This contest has ended. Congrats to our winner, Michael S.! 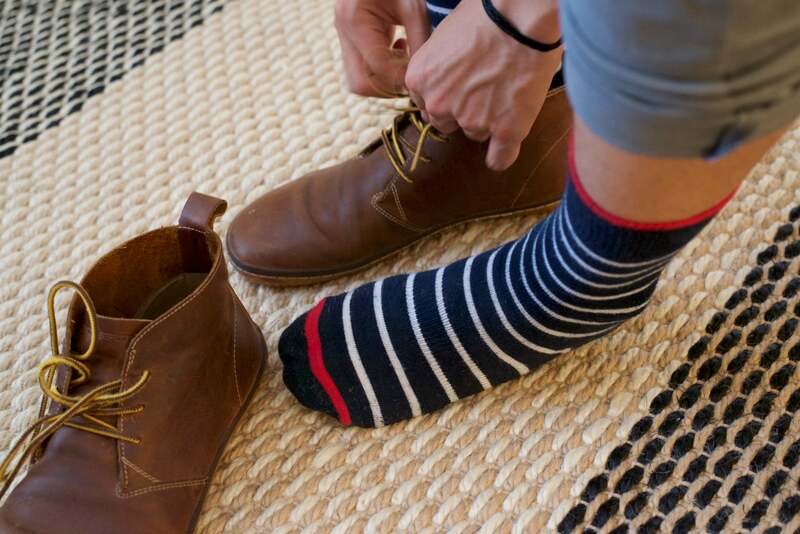 How do you keep socks from tearing? You infuse them with Kevlar, of course. That’s exactly what Kevlo Wear has done with their one-size-fits all socks. Made with COOLMAX, a breathable material, plus a bit of spandex for stretch, and enforced with Kevlar in the heel and toe areas, the Kevlo Wear socks look and feel like a normal pair of socks, but with a twist. Kevlar: a synthetic fiber of high tensile strength used especially as a reinforcing agent in the manufacture of tires and other rubber products and protective gear such as helmets and vests. Basically, Kevlar is a material that’s used to make stuff like bulletproof vests. Fueled by basketball and pop culture, socks have gained popularity as a fashion statement in the past few years. I’d admit, I have a decent sock collection myself, consisting of Injinji toe socks, a pair of Stances, and some merino wool pairs just to name a few. 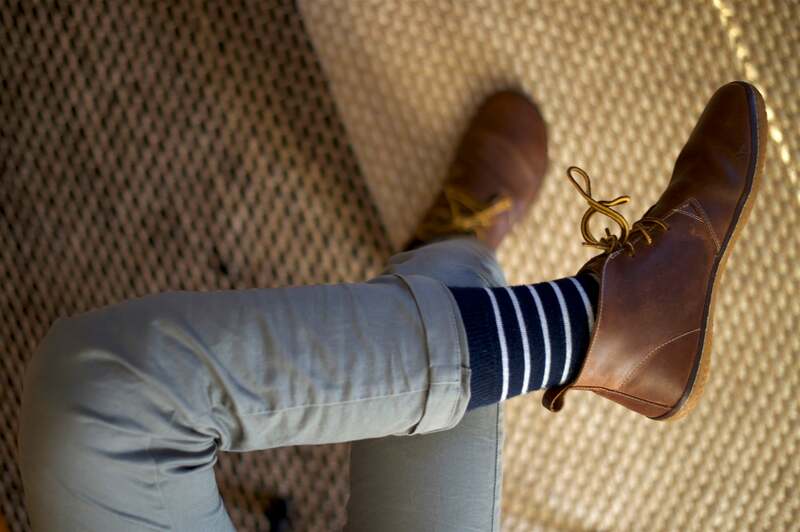 These crew length socks have a navy with white stripes design, which perfectly balances between fun and conservative. I’ve worn them with desert boots, dress shoes, and to the gym. The socks are more geared for warm weather. They could be worn for running, but I prefer to wear my low cut Injinjis for running. The reinforced parts of the sock are not any thicker than the rest of the socks. Right now, Kevlo Wear’s socks are sold as one size fits all. 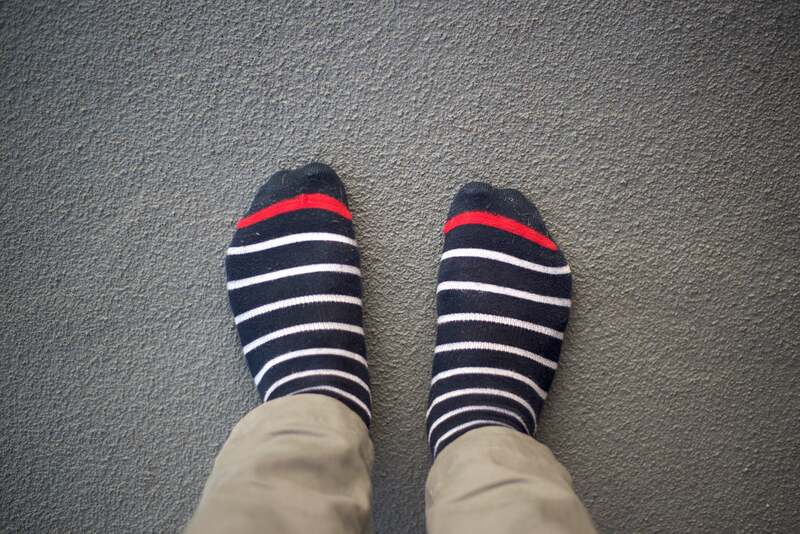 The socks fit my feet perfectly (I’m a shoe size 9), but I think it’d be better in the future for Kevlo Wear to make socks in different sizes so wearers can have a more customized fit. I would prefer if there was more kevlar used in the socks. The Kevlo Wear socks only use kevlar in the toe area and the heel. That makes sense since those are the most common places where socks tear, however it’d be nice if a larger amount of kevlar was used – currently my smallest toe is almost out of the kevlar reinforced section. Also, socks frequently have holes around the balls of the feet, so it’d be good if that area of the sock was reinforced. Currently, Kevlo Wear only sells their socks in the blue and white striped pattern, however they will be coming out with more designs in the future. The Kevlo Wear socks can be found on their official website for $12.99. Compared to a standard pair of Hanes crew length socks, the Kevlo Wears are pricey, but when you take into account the kevlar and innovation put into the product, the price tag is justifiable. Plus, I’ve spent over $20 on some pairs of merino wool socks. The Kevlo Wear bulletproof socks were provided for this review. As always, this Kevlo Wear socks review contains only my honest views and opinions. 🙂 Find out more about me and this site here.